Achilles Tendinitis accounts for about 10% of all running injuries – and you certainly don’t have to be a runner to feel its pain. In fact, an Achilles tendon injury can happen to anyone – whether you are an athlete or you are a average person going about an average life. A sudden movement, a turn or a pivot or just excessive walking can all lead to Achilles pain. Wearing high heels, having flat feet, having tight leg muscles or tendons, exercising without a proper warm-up, wearing old or poorly fitting shoes, having bone spurs, taking certain medications and simply getting older are also common causes of Achilles Tendinitis. No matter how you developed the pain, your main concern right now is probably how to get rid of it. That’s because Achilles Tendinitis can be a very bothersome injury, making simple tasks like walking to the refrigerator excruciating. Nobody wants to be unable to do things they have always done before – like jogging or going for a walk. I know what it is like because I, myself, suffered from Achilles Tendinitis not long ago. I’m going to tell you how I got rid of the pain and have never experienced it again in just a minute. This method has helped numerous people eliminate Achilles Tendinitis and I’m confident it can help you as well – allowing you to once again move freely without pain or stiffness. But first, before we get to that, let me introduce myself. 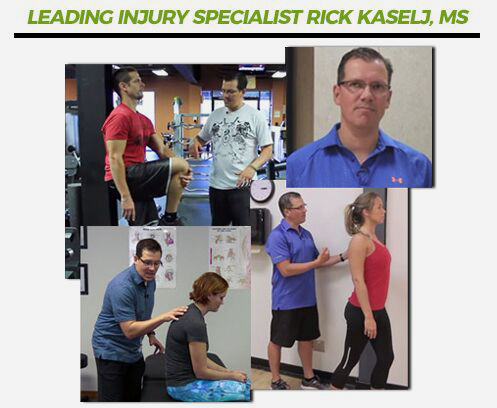 My name is Rick Kaselj, MS, and I create exercise programs that help people heal injuries and eliminate pain, so they can go back to living full, active, healthy lives. I’ve always been a fitness and exercise enthusiast, so starting in 1994, I decided to make this my career. I started as a Personal Trainer, an Exercise Therapist, and a Kinesiologist, but I quickly discovered that many of the traditional exercise and treatment programs weren’t producing the results I wanted for my clients. So I took it upon myself to get the right knowledge, scour the available medical research and do hands-on testing so I could ACTUALLY help my clients get better. I’m all about finding what works, and unfortunately, a lot of the advice out there, even from trained professionals and reputable sources … does not work! Some of the most effective methods I’ve discovered for eliminating pain and healing injuries are counterintuitive … and they required diligent research, testing, and creativity to discover. I love to travel and do fitness adventures. I recently hiked 4,300 km along the Pacific Crest Trail from Mexico to Canada and mountain biked the 5,000 km Great Divide Mountain Bike Route over the Rocky Mountains from Mexico to Canada. I’ve also toured three continents and visited 17 countries. I love to compete with other fitness buffs and athletes. I trained for and competed in the Manitoba Marathon, the 225 km Ironman Canada Triathlon, and the 160 km Sea2Summit Adventure Race in Whistler, BC. Now because of this active lifestyle, I was very concerned when I began experiencing Achilles Tendinitis while hiking in the mountains of California. As an injury expert, I knew how painful this injury could become. There was also the chance that I may have increased my risk for suffering an Achilles tear, which would mean expensive surgery to repair it. If you are concerned about pain or suffering a tear, I have good news. You see, I developed the framework of an Achilles Tendinitis treatment while I was in those California mountains so that I was able to finish that hike. Since then, I’ve fine-tuned this treatment and helped hundreds of people get rid of Achilles Tendinitis pain for good. The first thing you need to know about this treatment is that it doesn’t involve you taking any side-effect-laden prescription drugs or undergoing any risky surgery. You won’t even have to take time out of your busy schedule to meet with a doctor. With the Achilles Tendinitis Exercise Solution, or ATES, you are given a series of exercises that quickly and gently eliminate pain while strengthening your Achilles tendon. The end result is that you are once again able to move freely and without pain. This program worked for me, it has worked for hundreds of other people and I’m confident it will work for you as well. It’s very important, before you get started, to assess your current condition. This is the first thing I do every time I see a new client with Achilles Tendinitis. We need to understand how much pain you’re experiencing now, how serious your injury is, and what range of motion you can currently handle. Having this information will prevent further injury, and help you get the best possible results, in the shortest amount of time. In this component, you will receive a video and a brief manual that walks you through, step-by-step, how to do your own self-assessment. 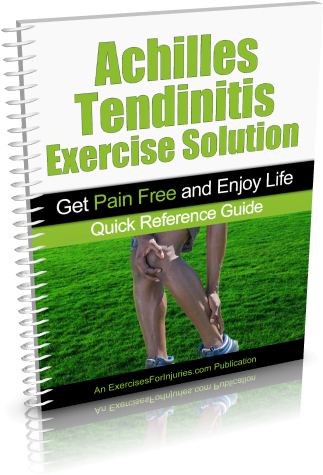 Based on this information, you’ll know exactly where to start in the Achilles Tendinitis Exercise Solution program. You will also receive a convenient Fill-In Sheet that allows you to write down each of your answers and results as you watch the assessment video and read the manual. When you get your Achilles Tendinitis Exercise Solution program, I want you to come up to speed FAST on what you need to know, so you can get started FAST, and start reducing your pain FAST! So, I’ve distilled the educational content down to the most important summary points you need to get going right now. In this Quick-Start Cheat Sheet, I explain, in plain English, exactly what causes Achilles Tendinitis, and I lay out the exact roadmap you’re going to follow to reduce and eliminate your Achilles Tendinitis pain. Achilles Tendinitis Exercise Solution is a comprehensive program of gentle, yet highly-effective exercises designed to reduce and eliminate your Achilles Tendinitis pain, and get you back to your active, enjoyable life. The program is broken out into 3 stages. The 3 stages progress from very easy (Stage 1) to more challenging (Stage 3). 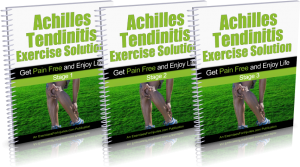 This 3-stage structure ensures that virtually any person can complete this program and solve their Achilles Tendinitis, even those who have severe pain, and even those who have never exercised a day in their life! The 3 different stages also allow you to self-direct your progress so you get the fastest possible recovery. 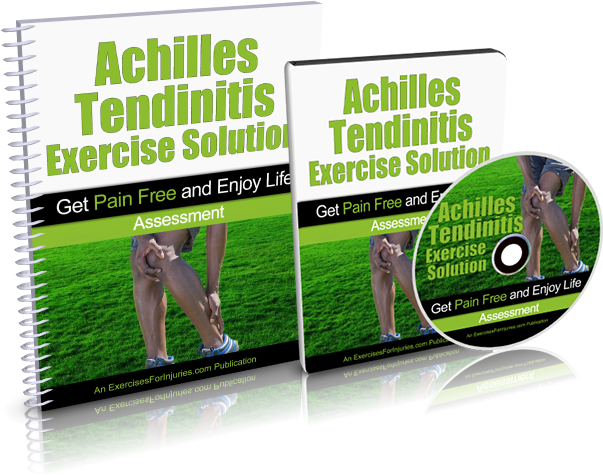 As mentioned above, for each of the 3 stages in the Achilles Tendinitis Exercise Solution program, you will receive an instructional video, a follow-along video, and a comprehensive manual. Peter Drucker said: “What gets measured, gets improved.” In my more than 20 years of experience as a kinesiologist and injury expert, I’ve seen time and again that the people who measure their progress while they do my programs typically get better and faster results than those who don’t. Most people who begin the ATES program report feeling better the very first day! Within a few days, your pain could be completely gone. Know to Defeat This Frustrating Condition! How much would you expect to pay for advice and information that will allow you to finally get rid of bothersome Achilles Tendinitis pain and once again be able to walk or run pain free? Certainly, even hundreds of dollars would not be unreasonable to many … but relax, you won’t have to pay near that much for ATES. In fact, right now, for a limited time, you can take advantage of a special promotional offer and receive the complete ATES program for just $37 – that’s $20 off the regular price of $57. We recently had this program assessed by medical professionals and they determined its worth to be $287. But if you act now, you can get it for just $37! 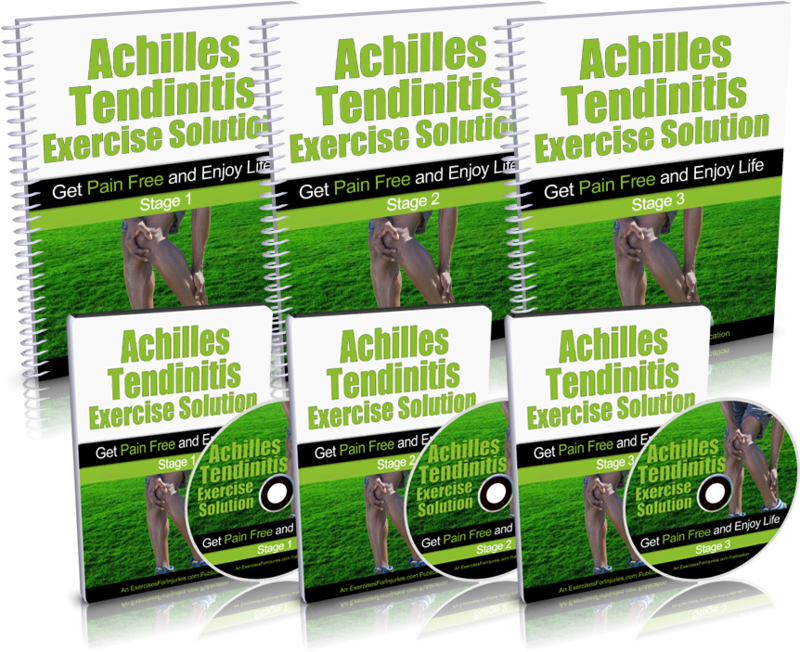 CLICK HERE NOW to order the Achilles Tendinitis Exercise Solution program for just $37! Relief is Literally Only Minutes Away! The treatments featured in ATES are completely natural, safe and without any known negative side effects. I must warn you that I can’t keep this program at this low price for long. It is far too valuable. I am so sure that you will love this ATES Program that I am offering a 100% money-back guarantee. You’ve got absolutely nothing to lose – except the pain you are currently feeling from your Achilles injury. Plus, don’t forget, if you order this program, you can take advantage of my immediate download feature to begin reading and benefiting from its expert advice and comprehensive information in just minutes! Pain or Stiffness in Your Achilles Any More! P.S. This special promotional offer won’t last long. Get ATES for just $37 before it is too late! P.P.S Also remember, that you are making this purchase at absolutely no risk. So grab this special price while you can! If ATES isn’t everything you were expecting, simply notify me within 60 days and I will refund your money immediately. 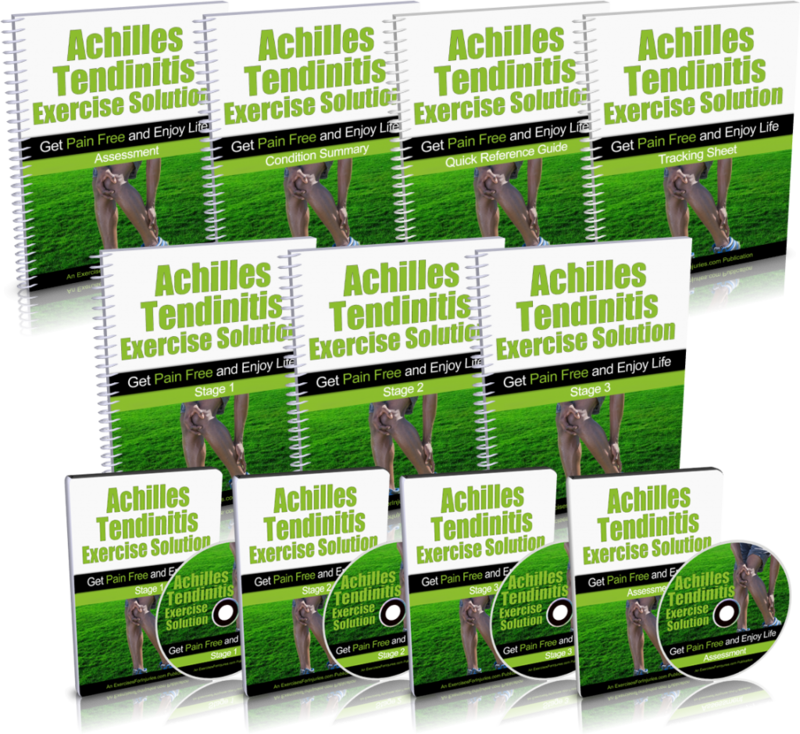 Let me give you one more reason why you should buy this program today: It gives you all the very best advice and information on overcoming Achilles Tendinitis in one easy-to-use resource. All of my injury and exercise programs were developed as a result of extensive research and study and years of hands-on testing and training. Many are counterintuitive to what “traditional medicine” recommends. But they work much better and much faster. Don’t prolong your pain and discomfort. Get a solution that works. Click here to order today.